Relive the excitement and be young again as Park Entertainment Limited is bringing you a reason to celebrate the resurrection and ascension of Jesus Christ. The four day Easter special is packed with lots of fun and games such as face painting, film shows, dancing clowns, bouncing castles, red carpet appearances, artiste appearance, train rides, and lots more. Come and experience the true meaning of fun and excitement. We hope to use the event to give parents and families a chance to relive their childhood day through the Easter wonderland family special. Come let’s show you the four wonders of the world this Easter, at Easter wonderland family fun fair, We welcome schools, churches, companies, and private individuals to this networking campaign. Come and advertise and sell your services to our audience, let’s make this season one to remember. The winds of fortunes are back again. We plan to offer what you have been told is impossible, the beauty of this event is with two thousand naira, every child is opportune to play on our game and items available at our ground, from 10am to 5pm without any extra charges. You also get to win free gifts and items from our sponsors. The adults are not left out as they also get to enjoy film shows and gifts during the celebration. The four day fun fair starts on Good friday to Easter monday from 10am-5pm everyday at the grand suit garden located at CMD Park Magodo. 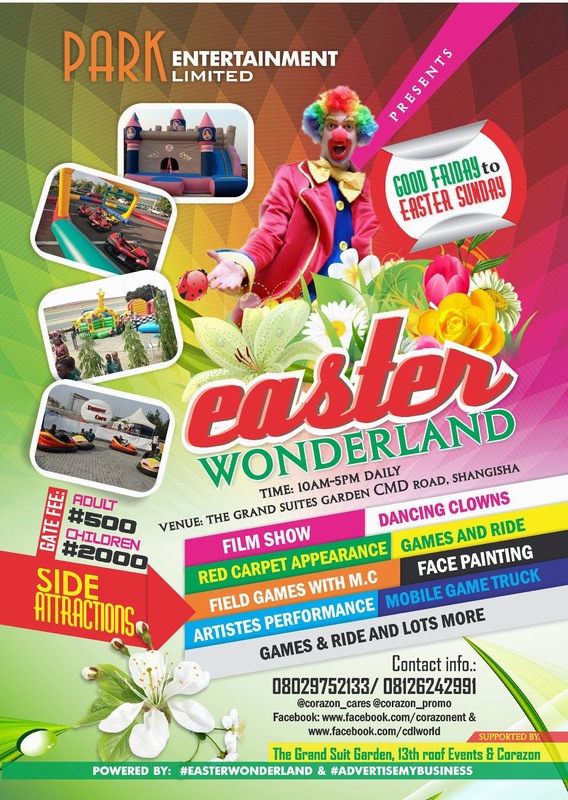 Take a leap of faith and surprise your child, wife, and family with an Easter get away at this year’s Easter wonderland fun fair.